The number of people receiving food stamps has fallen again, continuing to decline past last year’s record low of 45.7 million participants. This could be a sign that the economy is improving — higher employment means fewer people receiving unemployment and other benefits. But it’s also likely driven by people losing eligibility even if they’re still unemployed, a result of states becoming more and more stringent in their approach to non-working adults. Many states loosened the qualifications for receiving food stamps during the recession, and the number of participants greatly increased. But as the unemployment rate began to decrease, the states tightened up their requirements again, causing many to become once again ineligible. Regardless of the exact reason why, the number of Americans receiving benefits from the Supplemental Nutrition Assistance Program (SNAP), or food stamps, fell to about 44.3 million as of March, the lowest level since February 2011. 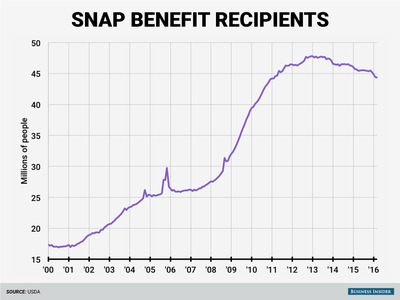 That also reflects a 2.8% drop in the number of recipients from the 45.6 million people with SNAP benefits in March 2015.